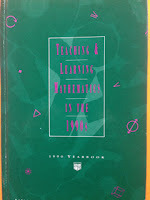 In the 1990 NCTM Yearbook on Teaching and Learning Mathematics in the 1990's, I wrote a Chapter titled: Effective Mathematics Teaching, One Perspective. And in that article, one section was titled Presenting the Content and Checking for Understanding. On the eve of the 2013-2014 and 2014-2015 launch of the Common Core those words, written 23 years ago, apply more than ever today. Our language has changed a bit, but remember in my December blog, when I claimed that you can't effectively check for understanding from the front of the classroom? This article, in its own way, supported that claim, with a few caveats. Although presented with minor edits, it represents the commitment to mathematics instruction we made at Stevenson during the 1990's. A commitment that is now required for all of us, because of the expectations for how children learn mathematics as presented by the Common Core and the CCSS assessments. In this blog, I present part of that Chapter from 1990 - in italics. The move into the presentation of content invites the question, "How do I check for student understanding during the presentation to class? Most teachers are very good at modeling examples, but tend to stand at the front of the classroom and check for understanding by using such verbal cues as "Did I go too fast for you?" Does everyone see that?" "Isn't this an easy one?" "Okay?" "Who doesn't understand that?" Often included is the very rhetorical, "Any questions?" 1. The teacher makes the false assumption that no response from the students indicates that everything is understood and it is "Okay" to continue. 2. The students develop a sense of lowered self-esteem if they do respond to them, since it is an admission in front of (all) their peers that something is not okay. Thus, teachers need to develop effective techniques for checking for students' understanding (these checks also give students an opportunity for reflection with their peers on the content being learned). There are three effective ways to check for understanding. On complex problems (Today we would say DOK 3 or 4) the teacher could help students set up the initial investigation into the problem, but then allow them time time to work together to discuss strategies for solving it. This is a good time to circulate among the students to find out if they understand the set up of the problem (today we might say "solution pathways") and possess the necessary skills for solving it. While walking around, the teacher is giving and receiving feedback and checking for understanding (Today we would say "provides formative feedback"). Note: It is in this section of the 1990 article that I attempt to describe one way you might be able to check for understanding from the front of the classroom. However, it is very very difficult to do really well. Effective teachers use questioning strategies that encourage all students to consider the questions they are asking. An effective questioning cycle must require all students to listen actively both to the question as well as to other students' responses. A questioning cycle likely to result in this active student engagement includes the following four steps. 2. Provide "Wait time" after each question to prevent any student callouts. 3. Select students randomly, making certain to call on all students. Call on volunteers as well as nonvolunteers. 4. Redirect individual student responses to other students for their judgement of correctness or for an extension of an answer. During whole group discourse from the front of the classroom, some students are reluctant to wait to be called on and like to call out an answer or response. Student callouts are disruptive to the flow of the classroom dialogue and allow certain students to dominate the discourse and force the direction of the classroom focus. Callouts also move more passive students to disengage. A phrase that encourages wait time is to immediately follow a question with "Raise your hand when you are reasonably sure of the answer". The questioning sequence provided below provides an example of an effective "Front of the Classroom" questioning cycle. Note: The names I used in this dialogue are my parents and at the time young children! T: Class. Can you provide me with an example of a triangle with an Area of 12cm^2? T: Okay, Roy. I noticed (when I was walking around) you chose a right triangle. Please explain your diagram to the class. (Roy did not have his hand up). R: I drew a right triangle with legs of 3cm and 8cm. C: In a right triangle, the legs represent the base and the height. Thus, A= 1/2bh or A=1/2(8)(3) which is 12cm^2, so I think Roy forgot to divide by 2"
T: Thank you! As I walked around the room, I noticed all of you used a right triangle. Can you think of an example that is not a right triangle? (Here this dialogue is best continued in a well-managed small group peer to peer discussion as the teacher tours the room and listens in). Increases wait time, severely limits student callouts, and promotes group feedback to a students' response with positive whole group student feedback on the questions you ask your class. 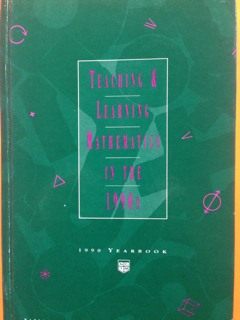 Mathematics classrooms of the 1990's were dominated by teacher talk, and often ineffective and false checks for understanding from the front of the classroom. 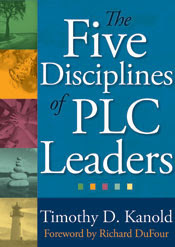 Today, in 2013, mathematics classrooms should be dominated by the use of effective problems and tasks that allow for deep peer to peer discussions as the teacher checks for understanding and provides the type of formative assessment feedback that engages all students in learning. This was actually the third way to effectively check for understanding in the classroom that I described in the 1990 article. Madeline Hunter called it Guided Practice, Spencer Kagan called it Cooperative Learning, James Popham and Dylan William call it Formative Assessment and the CCSS calls it Developing deep student understanding through the Mathematical Practices. I call it great instruction that respects student engaged learning as an essential classroom tool for feedback to learning. I wish you well in that pursuit. 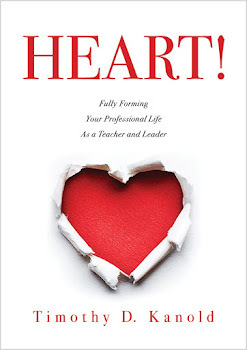 In the 1990s, I developed a cross-curricular course that meets the demands of today's CCSS. Because it was grant funded work, I spent more than 30 days in one year alone sharing the work and the results. The curriculum and the instructional practices were deemed by many teachers too innovative (different from then current practice) and too much work. Admin saw too many challenges in scheduling. No surprise to those of us who developed this dynamic model. Thank you for speaking out to note that good teaching is good teaching, no matter the era or the label. The key is motivating those who have access to change: practicing educators, teachers and administrators.